Dan Ashworth's position as the Football Association's technical director is "untenable", says former board member Dame Heather Rabbatts. Ashworth appeared at a parliamentary inquiry on Wednesday over the FA's handling of discrimination claims against ex-England women boss Mark Sampson. "There's a feeling sometimes that these issues of diversity are not as important as the big stuff," Rabbatts told the BBC. "All the profits the FA has will not buy back its loss of reputation." Ashworth has been at the FA since 2012 and is in charge of England's elite men's and women's teams, as well as FA education and coaching. He helped appoint Sampson - who was sacked last month after evidence of "inappropriate and unacceptable" behaviour with female players in a previous role - in December 2013. The FA has to send a signal if they want a more diverse group of people to become involved. Rabbatts stepped down from her role at the FA in June, citing frustration "at the lack of progress for BAME coaches". She said: "This is a fundamental moment for the FA - the national governing body of our game, whose strap line say it's football for everyone. "Well, it's not. My really strongly held view is something has to change." When contacted by the BBC, the FA declined to comment on Dame Rabbatts' interview. The governing body apologised on Wednesday for racially discriminatory remarks made by Sampson to Aluko in 2014 and to her Chelsea and England team-mate Drew Spence in 2015, as a reopened investigation into their complaints was published. An independent barrister, Katharine Newton, ruled that Sampson made unacceptable "ill-judged attempts at humour" on two occasions and made remarks which were "discriminatory on the grounds of race". However, she said she did not believe he is racist and said Aluko was not subjected to "a course of bullying". FA chief executive Martin Glenn said Sampson, who was paid nine months' salary on his departure, may proceed with a wrongful dismissal claim. Ashworth appeared at Wednesday's parliamentary inquiry alongside chief executive Glenn and chairman Greg Clarke, as well as human resources director Rachel Brace. 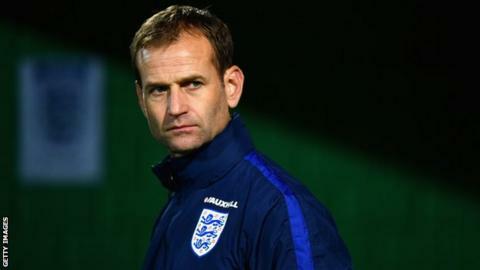 Following Sampson's sacking, the FA said that Ashworth - along with director Kelly Simmons - were not aware of any allegations before hiring him, but BBC Sport understands England players were aware of rumours. Clarke told parliament that "a process of due diligence" should have happened around Sampson's recruitment, while Ashworth admitted he should have "asked for more detail" about the safeguarding report into the 34-year-old Welshman. Ashworth also asked Aluko to be part of a cultural review of all England teams in early 2016, which is when she made her complaint of "bullying, harassment and discrimination." He then began an internal review into those claims, at which he reportedly offered to give evidence on behalf of Sampson. FA's head of women's football Baroness Sue Campbell told BBC Sport on Friday that Ashworth will be part of the recruitment process for the new England women's manager. Asked about Ashworth's position, Rabbatts said: "I think it's untenable. He's been there since 2012. These issues have been raised - the lack of diversity, the issues of Mark Sampson, the matter of Eni - these have all happened. "I read today he's now leading the search for Sampson's replacement. So when the FA say things are going to change - what is going to change? "When you talk about leadership in organisations, when people talk about bringing culture, I've heard people argue there has to be root-and-branch reform. Who is going to lead that? It can't be the leadership that is there." The FA has been heavily criticised for its handling of Aluko's case, but Glenn was backed by Baroness Campbell on Friday. Ex-England striker Ian Wright said he "could not work" in the FA in the current climate, while another former England international, Trevor Sinclair, told the BBC trust in the organisation was at an all-time low. Rabbatts said that tackling the culture at the FA would require "leadership from the top". "We have, across 24 men and women's team, the most amazing diversity. We should all be proud when we look on the field of play," she said. "But when you look at the leadership, at the bench, at everybody else, it does not in any way mirror that. That leads to a culture which is closed and where individuals can be subject to, sadly, these sorts of comments and it's not tackled immediately." She added that the FA has to make big changes to encourage more diverse leadership within the body and to address the people who feel fundamentally let down by the body. "Apologies don't take us very far, sadly," she said. "Was there real contrition and sorrow [at the parliamentary inquiry]? I'm not sure I saw that."